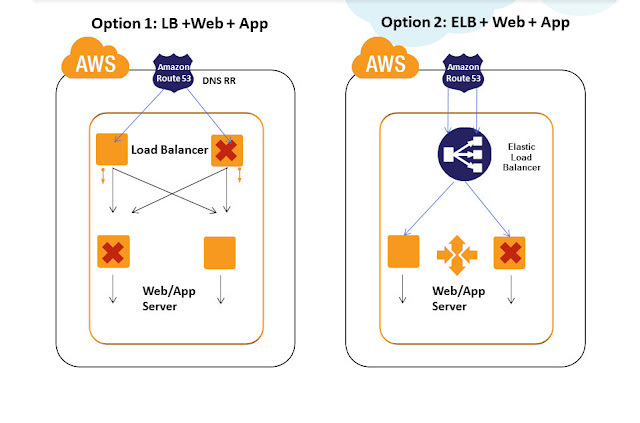 Scale out of Load Balancers is better than Scale UP in AWS. Scale out model inherently adds new LB’s into this tier avoiding SPOF. Scale out of Load balancers like Nginx, HAProxy requires custom scripts/templates to be developed. It is not recommended to use Amazon AutoScaling for this layer. Now lets get a layer above LB -> The "DNS" ,Amazon Route 53 is a highly available and scalable Domain Name System (DNS) web service. Route 53 effectively connects user requests to infrastructure running in Amazon Web Services (AWS) – such as an Amazon Elastic Compute Cloud (Amazon EC2) instance, an Amazon Elastic Load Balancer, or an Amazon Simple Storage Service (Amazon S3) bucket – and can also be used to route users to infrastructure outside of AWS. AWS Route 53 is AWS inherently fault tolerant building block and a Managed DNS service. Amazon Route53 can be configured using Console , API's to do DNS level Load Balancing. RR or Weighted algorithms can be configured at Route53 level and requests can be load balanced between the Multiple Load Balancer EC2 or ELB configured under the Route53. Route53 DNS RR cannot check the health of the Load balancers and direct the request; hence it relies on the browser or the web clients to do the transparent retry in case they encounter error pages.